We love celebrating strong, successful women here at The Caviar Spoon, which is why we’ve created ReBelles. These are the women who are working it and owning it in life, work, and everything in between. Our newest ReBelle is South African entrepreneur Bev Missing, founder of eco-friendly and cruelty-free bath and body brand Rain. From woman to woman, we pass along knowledge, praise, opportunities, stories, and hope. Bev Missing is no exception. We learned about this inspirational woman when we asked another one of our ReBelles, Tamburai from ONEOFEACH, about a woman in business who she thought deserved a shout-out. Her answer was Bev Missing, the founder of Rain, “a beautiful businesswoman with an amazing energy and a loving spirit”. As soon as we read that glowing praise, we looked up Bev and her company and were immediately drawn to Rain’s philosophy and story. 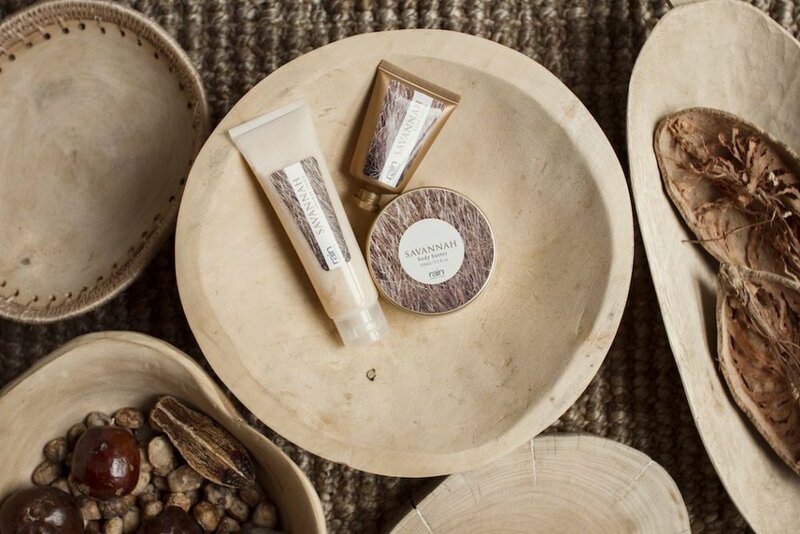 Their product range is based around sustainably harvested indigenous plants and the products are made without parabens, petroleum jelly, petrochemicals, or any of those other not-so-great-for-you synthetic additives. Rain is also world fair trade-accredited and eco-friendly. They are dedicated to using all-natural ingredients, as well as making sure that the papers and fabrics used for their products and packaging are biodegradable and natural whenever possible. Their carbon footprint is reduced through deliberate actions like choosing hand labour over machines and gas over electricity (which is generated by coal-fired power stations). Finally, they test products on themselves – not animals! When we reached out to Rain to see if it would be possible to do a Q&A with Bev, the response was “Rain is her passion, pride and joy, and she doesn’t mind sharing her story as it can help others see that anything is possible”. Bev started Rain in order to create jobs in her area (the lovely town of Swellendam in the Western Cape province of South Africa) and it has since grown beautifully, with retail stores across the country and internationally, as well as a couple of spas. But despite its growth, Rain still remains a community-focused company that keeps its core values very close to its heart. All of their products are handmade in order to create jobs and provide employment opportunities where, in other scenarios, people might be replaced by machines. And just like there is slow fashion, here, they practice slow beauty (if that’s a thing). Their soaps are mixed, molded, and carved by hand and it takes four to six weeks for them to cure before the soaps get sent to the shops. There’s even an artisan soap range where the soaps are signed by their makers. Rain’s boxes are also made by hand, from cutting the sheets through to the embroidery on them. They employ ladies from the community to do some of the embroidery, as well as knitting and crocheting the baby items that Rain also sells. Rain strives to give back to the people and the community in a supportive and sustainable manner, much like the age-old saying above. They offer training (not just for work-related skills) and regularly bring in specialists to talk about life skills, such as health and financial matters like investing and saving. Juani Walters, who does the marketing for Rain, shared a story with us during our initial email exchange that both completely inspired and deeply touched us. It proves that Rain is a company that deserves every ounce of support, and that Bev really is a beautiful soul who puts people before profit – a rare quality these days in the money-driven world of consumerism. I have been self-employed my entire life, apart from a stint as a waitress while at university and a one-year job looking after a big tree nursery in my early twenties. I have owned an antiques business, a boutique hotel and restaurant, a décor shop. It was not such an “AHA” moment. It was a dawning realisation that crime was rapidly on the rise in our area, and if we did not do something to create employment, we would never stem the tide. Rain was started to create jobs in a country with an unemployment rate of close to 40%. Different people along the way. Currently, it is Maranda Engelbrecht of Babylonstoren, who is the most talented lady I am privileged to know. She pushes boundaries and she never compromises on what she wants. Seeing that what I do and the decisions I make have a knock-on effect for the 140 people I employ and, of course, their families, as most of them are the breadwinners and support an average of five people. It is a huge responsibility, too, but it is what makes me feel I have a purpose. And the biggest challenge being a businesswoman and entrepreneur? Firstly, all the red tape and barriers to entry – all the bureaucracy and hoops you have to jump through, all the regulations and compliances you have to adhere to. It stifles and kills entrepreneurship, it costs time and money, and really puts speed bumps and sometimes mountains along your path. I switch off all communication, get on a jet plane, and completely leave my routine and comfort zone. I go to exotic strange places, stroll the marketplaces, expose myself to different tastes, smells, sounds, sights. I spend time with my headspace and the ideas flow like gushing streams. My second option is to just get out into nature to be replenished and recharged. By how many people my business is impacting in a positive way. The biggest learning lesson since founding Rain? Nothing ever comes easily. No matter how it looks from the outside, you have to push and struggle and persevere and never, ever, ever give up. You have to climb every mountain one foot at a time. What advice would you give to women looking to succeed in the workplace or in their own business? You have to be willing to take risks and believe in yourself. If it was easy, everyone would be doing it. Step out of your comfort zone and follow your passions and dreams. Don’t take no for an answer and just keep on keeping on, no matter what. We loved the story about Bydon and how he was given an opportunity that may not have been available to him otherwise. Are there any other personal stories like this that you’d like to share? We employ a young lady named Clary. She was twelve when she fell pregnant, had a baby at thirteen. She cannot read and write and has never been to school. She lives with no electricity, no bathroom, no running water, and both her parents are alcoholics. She has now had a third baby. We employ her as a cleaner and have made sure that her two children attend school. We have tried to impact her life with training and mentoring and just being a soft employer – very tolerant of her circumstances. How do you maintain the core values and integrity of Rain (cruelty-free, fair trade, supporting the local community) as the company continues to expand? So far, so good. We are still small and it is thankfully still very manageable. I can’t say that it will stay this easy as we grow. We will have to find ways to make it work as those values are core and not negotiable. What made you choose New York as the location for the first retail store outside of SA? My business partner lives in New York. Do you have plans to open in other locations? Doing business in the USA has been one of the most difficult things we have ever done so that’s a tricky one to answer. You have a wide range of products…how have these come about? How much do your staff influence the creation of products (such as taking into account their skills and what they have to offer)? Our range is broad – around 500 product lines with around 7,000 raw materials. We are a creative bunch of people who are passionate about making new things. Hopefully stores in more countries and a new state-of-the-art factory. I am hopeful. I am not materialistic. For me, experiences are more valuable than things, so I work hard, but on weekends, I make a point of making memories with my husband George, doing amazing adventurous things. Life is short – it must be lived to the full. You make a living by what you get but you make a life by what you give. Just do it and do it now. Live life simply, naturally, authentically. Hunter gatherer story teller – hunting for new plant actives in the wild, finding tribal stories, documenting them, telling them. The African bush (savannah). I name a product range after it. Anything we should keep a lookout for? New products, stores, developments, etc.? We are in negotiations to open stores in the Middle East – that is super exciting. We are launching a men’s range later this year and a face care range in early 2018.